Five centuries under the Roman influence have left impressive marks in this town. 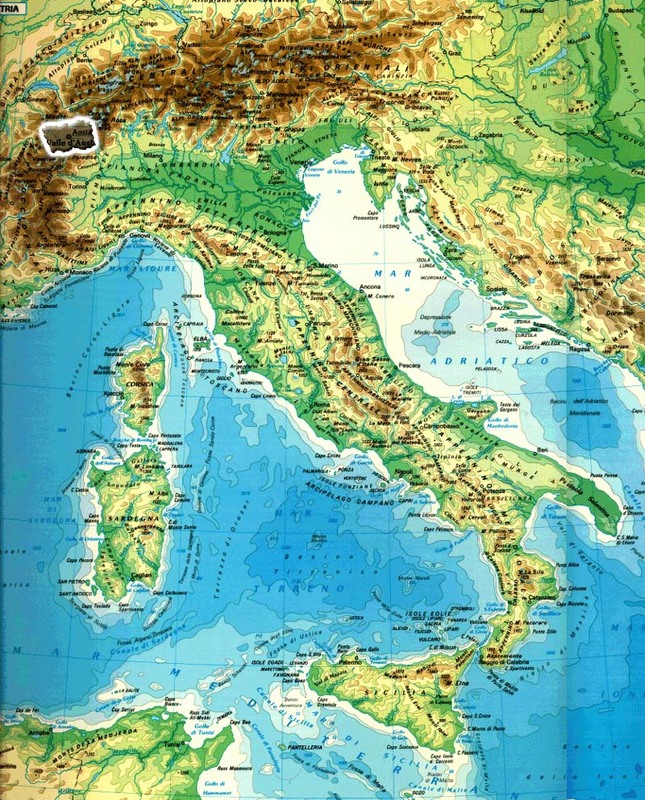 After the defeat of the Salassi (the local population), in 25 B.C. Augustus founded a city. He gave it his name and stationed there three thousand soldiers of the praetorian cohorts: hence the name Augusta Praetoria Salassorum. It was the mark of Roman military colonisation: a strategic centre to establish control over a newly conquered territory and over the way to Gaul. 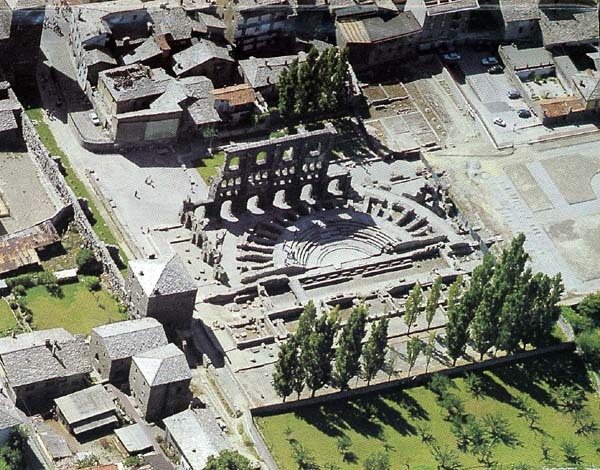 Born at the peak of an extraordinary town-planning experimentation, Aosta holds and synthesises the best architectural aspects of the Roman empire; it constitutes a sort of ideal city, a model which is still visible today in the preservation of the original layout and tis most significant structures. The city is a rectangle bound by the city walls, that is subidivided into blocks crossed through with perpendicula roads. The same roman structure is still visible in another famous Roman Italian Colony: Verona, in Veneto Region. To testify its Roman past there are: the Augustian Arch (the entry to the town since the beginning of time) that was probably constructed in the same year as the foundation of the city, in honour of Augustus, the victor over Salassi; the City walls and the Towers which show the military and strategic function of Aosta. The Walls, in travertine rock, have a prerimeter of 728 x 574 metres. At their four corners and far about every 20 metres stood the towers: some of these are still preserved; of the four city gates, the only one remaining is the easternPorta Praetoria. 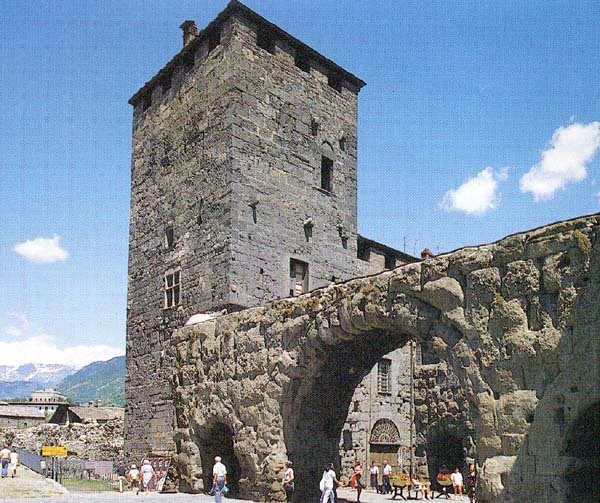 It is considered one of the most beautiful and best preserved city gateways of the Roman World; The remains of the Amphitheatre are contained in the monastery of Santa Caterina and it could hold up to twenty thousand people, more than the entire population of Aosta. The city boasts also a Theatre of which only the colossal southern face remains standing: it is 22 meters high and it is protected by a scaffolding structure in an attempt to preserve its integrity. The majestic façade (which is still visible), of the main rectangular body of the building which surrounded the semicircular cave, gives weight to the hypothesis of a covered theatre. Inside the Archaeological Museum you can find unique Roman works of art such as the famous bust of Juppiter. The ryptoporticus is one of the most fascinating and best preserved places of Roman Aosta. It is a half-baried gallery with two aisles, held up by powerful pillars in travertine stone. The garden in front of the Cathedral which leads to the Cryptoposticus, marks the level of the forensis sacred area which included two temples in the centre. The plinth of one of these temples is still visible. To the south of the squere opened the wide porticoed forensis public area. Another important testimony of the roman past of this city is the Roman Bridge over the Buthier River: it is perfectly preserved and still used for thoroughtfare even though in the Middle Ages the Buthier changed its course and its waters no longer run under the single 17.16 m wide arch of the humpbaked bridge. 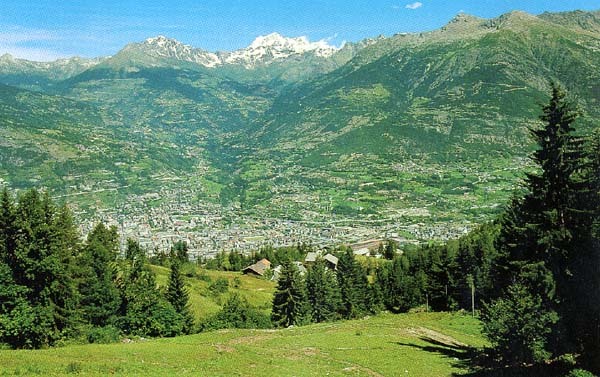 Between the IVth and the Vth Century Aosta became a dioceses. Aosta is rich in Early-Christian evidences: beneath the Cathedral of Aosta foundations, paving, baptismal fonts, mosaics, staiways and tombs have been discovered. Together with the monumental complex of Sant'Orso, the contemporary one of the Cathedral represents the main expression of the Chiristian Art and Architecture in Aosta. The earliest group of Aosta's Episcopal buildings, built on the site of the Roman fourm (Probably in the IVth Century A.D.), included two churches and a baptistery. Recent archeological exavations have brought to light two batismal fonts, architectonic fragments and decorations, mosaics, staircases and marble transenna with bas-reliefs, many tombs and two episcopal burials, articles that cover a period between the IV and XI Centuries. During the episcopate of bishop Anselmo (994-1025), the Romanesque Cathedral was built, today recognizable by the two aisles and the central nave, the crypt, the two orientated bell towers and the mosaics of the Chancel. 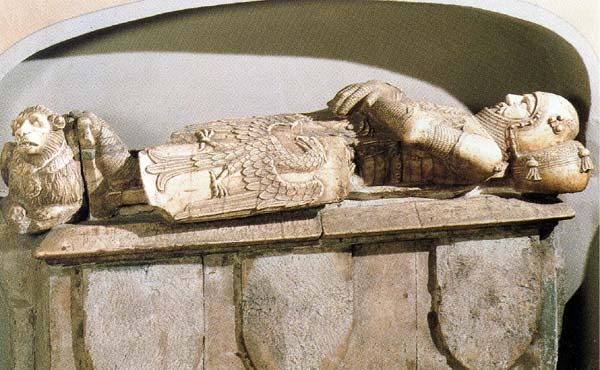 The first series of works dates from the end to the XIIth Century, with the demolition of two of the five original apses and with the construction of the deambulatory; between 1422-1460 the little cloister was added, while from 1490 to around 1510 the deambulatory and Gothic cross-vaults were rebuilt. At the beginning of the XVI C. (1522) the façade was decorated by motifs in relief in plychrome brick in Lombard-Renaissance style. The last phase of works was carried out between 1838 and 1860. The Cathedral complex, dedicated to the Assunta, also includes the extensive museum of Treasure, the Ottonian paintings in the attic, the cloister and the adjacent building of the bishop's residence. The Chancel is the most important part of the Cathedral from an artistic point of view. The mosaics of the floor are devided into two squares. The lower on (XII century) is more detailed and portrays "The year and the months" symbolised by agricultural scenes with the four rivers of terrestrial Paradise at the corners. The upper mosaic (XIIIth-XIVth centuries) depicts hideous animals and the Tigri and Eufrate rivers. The Cathedral boasts an important Museum of Treasure which contains marble sculpures, wooden icons, reliquaries, goldsmithery and other exceptional pieces. Beside the Monumental complex of the Cathedral, that of t' Orso, with its Architecture and medieval religions works, is the best known in the Valley and one of the most famous in Europe. Originally built in Romanesque style and altered in the following years by works in Gothic style, it includes the Collegiate Church of Saints Pietro and Orso, the Bell Tower Block, the crypt and the Museum of Treasure, the Cloister and the buildings of the Priorate. Important are also the The Museum of Treasure and the ancient cemetery. Other important churches are the Basilica of San Lorenzo, a little late-gothic church, and the Church of Santo Stefano with its 18th Century painted façade.d fa The city of Aosta is rich in ancient Towers: the Lepers's Tower (Torre del Lebbroso) a part of which dates back to Roman Times and that became a leper hospital in 1752; The Tower of Bramafam dating to XIIIth Century; The Tour Neuve built in XIIth Century; The Tower of the Pailleron (of Straw because it was used as a store for straw) of roman origin, and The Fromage Tower. The House of Sant'Anselmo, the Regional Archeological Museum and the Academy of Sant'Anselmo with its Archive are worthly of a visit.